Hello? Rhia a tall young woman with beautiful red hair, trailing down her back, was taking a walk past fields of grass through the lush green forest when she stopped short in front of the most beautiful image she had ever seen. She gasped, just staring at this magical wagon, with different colors, different textures. She said “Hello? again.” It was odd, she was sure she could hear whispers and giggling but she didn’t see anyone around. She felt incredibly safe so she climbed up the steps and peered into the wagon. Rhia was a quiet but very strong young woman, having lived on the streets and shelters before, but as soon as she got to the top step she suddenly she felt a rush of happiness and love enveloping her. She never felt this feeling before. She walked around the carriage noticing the brilliant colors and daring to touch the lovely, embroidered, velvet and cotton and silk fabrics. She listened closely the sounds that the bells made swinging in the air. She KNEW she had to know more about this magical place, she couldn’t leave, she would not leave for anything in the world. Her life, in the past had always been disconnected, she loved no one, no one loved her. She had never known what happiness was but she was beginning to think that a miracle had happened. Today was the first day she felt a thrill of excitement and joy, her life was, from one minute to the next, blooming in vivid colors. She was part of a tapestry of richness and the Earth, magic, starlight, sun, moon. Immediately, her dull, tough, cold past and all that she once knew disappeared. She couldn’t remember anything that had happened before this day, but she knew by the way her heart was warming up inside her, she had just arrived home. Rhia had been a wanderer before this, a sad, lonely young teen with fiery red hair trailing down her back. She had been born to live with nature, and as soon a she entered the wagon, she met a beautiful, mystical woman who she felt an immediate connection with, her name was Mother Ash. Ash and Rhia had been searching for each other for so many years not that they knew it, until they met that day and then they knew they would never be apart, not for a single day. Together, they lived in the magical wagon with animals as their extended family to keep them company, to give them a home, to feed each other to sing songs together at night, to wake up together in the glorious sunshine. 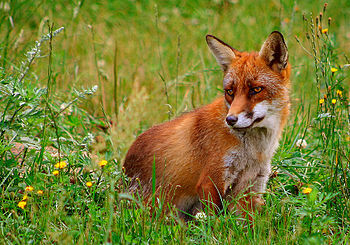 A wolf was their best friend, and a furry-red haired fox that they knew must have been one of Rhia’s younger siblings, their hair was so similar. Two large dogs stayed with them to protect them and keep them warm and two goats named Larry and Lena provided milk and home-made honey-lavender ice cream. The bees that swarmed were friendly, offering honey and among the grass precious plants grew, sweet-smelling lavender, mint and chives, dill and there was a huge vegetable garden that could keep them eating happily for months. They had eggs and cheese and of course they had no meat, how could they eat their friends? The wagon never moved, except in their imagination. They didn’t want to hurt horses by making them pull, horses were their friends. Finally, when Rhia and Ash had lived there for three weeks and three days, the faeries and gnomes, feeling satisfied, presented themselves to Rhia and Ash. They had to be sure that these were the right people and of course they were. At night, you could hear music that the animals played together, the sweet sound of the faeries giggling around the circle that they made, music played by the owls in their trees, the birds tweeting their flutes and the squirrels banging softly on their drums. Rhia and Ash lived there forever, with more and more animals joining them, the sky in the morning was sunny every day, the night ended softly, phasing out with a beautiful blend of colors, a gorgeous sunset, that all the friends sat together and waved to say good-night to the sun. different ways. One was potato with peas and lentils, one was spinach and the other was filled with lamb and spices. 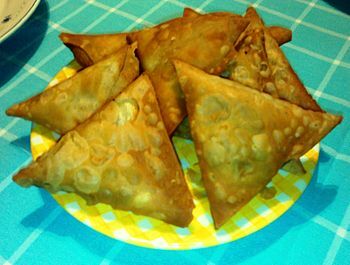 They were delicious and filling and frankly my stomach could have stopped there but what’s the fun in that? We then ordered Shrimp Saag, shrimp in a bed of spinach ( I thought there was a little cream in there, my husband said absolutely not) and an amazing sweet dish of chicken in a yellow cream sauce made of honey, cashews and apples. The consistency was smooth so all the ingredients except for the chicken were blended, creamy and rich. We also ordered one portion of Nan which resembles pita bread if you ironed it to barely nothing. After all, what good is all that creamy, sweet sauce without the proper bread to dunk it in? 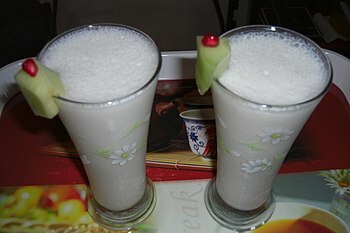 I drank a sweet Lassi ( a yogurt drink made with ice, rosewater, sweet syrup and blended) see the easy recipe below, and my husband had some alcoholic drink with figs, rum, bourbon and too many other ingredients. I took a sip hoping I would like the taste. I made my usual disgusted face that my family is so fond of seeing, gasped and reached for my water-glass to clear my palate of that nasty alcohol taste. Next time:I’m ordering a double lassi, on the rocks. Put all ingredients in a blender until smooth. home we had dessert (I deeply regretted not ordering the yogurt balls in honey…) so I had the gigantic molasses cookie I had purchased at the small grocery story in town. It was enough for three people but I finished it with ease. Had too much sugar and no spice ( I expected ginger) but I’m not that fussy so I ate the entire thing. Around 9 pm my husband and I roamed around the kitchen because at that point we were ready for a snack, I just needed SOMETHING. I headed to one of my all-time favorite snack combinations and one of my dog Lexi’s favorite snacks too. A small packet of square pretzels, two slices of Kraft Individually Wrapped American cheese and a box of chocolate Yoo-Hoo to drink. Now that, was a perfect snack. It is always the perfect snack for me and for my dog. I only gave her one pretzel and bite of cheese but she knows the sound of the pretzel bag and comes running when she first hears the bag rustle. Basically, you can take me out to a fancy dinner anywhere but when I come home, I retreat to the food I really love. My snack: pretzels, Kraft American cheese slices and Yoo-Hoo, my childhood drink of choice. I went to bed, happy. You know when I get something in my mind (like food) I need to have it fairly quickly. 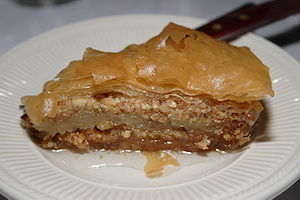 I am in search of baklava, so by the end of this weekend, rest assured, I will have had some. Honey, yellow, sticky and sweet, thin layers of phylo dough. It’s not only my favorite color, yellow, but easily in one of my top five favorite desserts. God Bless the fine people who made these desserts. I’m drooling. Honey, from the Honey Bee Farm is so comforting. 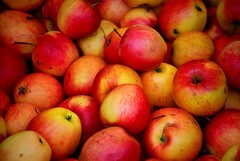 It is eaten on toast with butter, it is swallowed with lemon to soothe a sore throat. It’s natural, it is used instead of sugar, it reminds one of childhood and peace. Honey is a universal food, used in many countries all over the world. 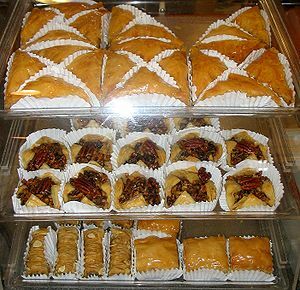 It is used to make sandwiches with peanut butter and bananas in the US or in Baklava, in sweet pastries from a number of countries all over the world esp. Greece and Turkey. Honey is warm, liquid gold. It is so perfect when the nights are cold and you need comfort, honey, slowly swirled in a cup of chamomile tea. Sometimes all we need is a change of attitude. Or a good night’s sleep or the morning light that makes evening’s horrific problems seem not so bad after all. It’s hard to wake up grumpy after nine hours of sleep. My back is a little better so that’s an improvement and I hear the cardinals tweet their beautiful songs right outside my window. It’s raining but the light gray skies look hopeful, almost as if they were encouraging the sun to come out and play. I found a diner that serves carrot cake by the slice but ever since I saw it I haven’t been back to buy it. Just knowing its available is good enough, well, until tomorrow when I go back, hand them my cash and run. Writing about my narrow angled glaucoma last night made me feel relieved. It had never occurred to me to write about it before and I find that strange. I can post about Fibromyalgia but this horror, this reality, had subconsciously become my scary secret. It’s as if before I had avoided a part of my own reality: I’m scared to death of going blind and the procedures themselves are excruciating. Help me. Please. Tonight I will break apart the multi-grain French loaf that I bought at the store yesterday, warm it up and eat it with olive oil or butter and a chunk of sharp white cheddar cheese, and honey and that will be my dinner. I will drink diet vanilla Coke out of a wine glass and celebrate being alive, celebrate yesterday being over. My headache throbs incessantly and will not go away. Weather? Stress? Fibromyalgia? Life? These days I’m a single mother of two active and self-involved teenagers that dance around me. There is no real communication or help, because they are only concerned about themselves and their private worlds of friends. I lost it today, saying I was not “their maid” and they need to help out. At 16 and a half and almost 18 and a half they should really know better but they don’t. Age appropriate? Probably. Annoying? Definitely. 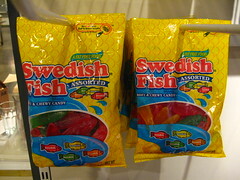 I am looking forward to watching Modern Family tonight on television while eating Swedish Fish. Yesterday was the first time I ever had a Swedish fish, I took a few out of the bags I had bought my children and tried them. I now know why they love them. The texture is smooth, slimy, sugary sweet and strawberry? I eat them gingerly not wanting to tempt the pain of TMJ. Even so, Swedish Fish (and no, they are not paying me) truly are a delicacy, because other than ginger-lemon cookies, they are all I’ve got. Sugar therapy. Works for me. The sun is shining, I have my ready-for-Spring green jacket on and I am gathering my blessings like a girl in a field of wild flowers: purple, pink, apricot and blue arranging them in a wicker basket. Today, my heart feels light, my steps seem smooth like I was on an invisible ice-skating rink and my elbows, fingers, knees are relatively pain-free. This is a gift from Spring, at least for the day and my body rejoices. Will I pay for this feeling tomorrow? Probably, but right now I don’t care. I raise my face to the sun and delightedly close my green eyes. My hair hangs around my shoulders loosely. There, right there, the first hint of Spring in the suburbs. My nose gets kissed by the morning air, the 70 degree temperature makes me wrap my arms around myself and I eat golden honey on toast with butter and slices of a green, tart, Granny Smith apple. I am not in pain always, I just write about it when I am. This is my apology to those who think I have NO good days or at least some better days. I am here today and I am enjoying life. A purple crocus is peeking from the earth, my beautiful, shiny nine-year old dog is ecstatic to be on a leash and outside for a leisurely stroll. I am as excited for her as I am for myself. The snow returns tomorrow and the day after but that happens every year as March comes to an end and the pranks of April Fool’s Day come early. 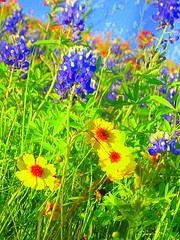 The one day of warm springtime teases us like a devilish child that loves to taunt and run away to safety. We have all known and loved that twinkling, mischievous youth. We know that there will be a few more days of snow and many more of rain and gray puddles. But, since we have tasted Spring on our lips, like the first soft-serve vanilla Carvel ice cream cone of the season, we know that it will come back to us soon. It will be even warmer, and lush, with green velvet grass sprouting and windows wide open to chase away the miserable coldness and stuffiness. Once we have sniffed the Spring, we embrace it, when it returns, like a lost puppy. Laughing now, we drink iced tea and grin widely as we look at a bowl of lush lemons gleaming in a simple, blue glass bowl. BREAKFAST! Pancakes with sweet maple syrup and a pat of melting butter, English Muffins with cream cheese, butter or peanut butter and jelly, scrambled eggs, fried eggs, egg in a hole, bacon extra well done and crunchy, cereal…. Want more? 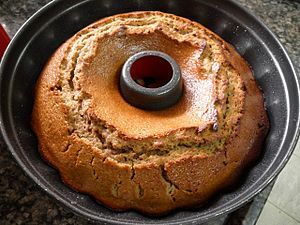 Scrambled eggs with cheese or an egg and cheese sandwich on a roll, French toast, sometimes with cinnamon, sometimes plain, cinnamon-sugar toast, a fruit cup, ripe red raspberries, plump blueberries, a sliced banana cut into “coins.” Strawberries and nuts and raisins and brown sugar in hot oatmeal. Your beverage order? Freshly squeezed orange juice, hot chocolate, coffee, tea? Toast or bread with butter and honey. I’m drooling here…….Breakfast is comfort food, I like just about everything. It’s warm, it’s a memory of your childhood, it is sweet cinnamon rolls with vanilla icing. Just one thing, please hold the sausage. I’ve just crawled back into bed, clothes off, night-shirt on, bronchitis as my diagnosis. I have taken the third dose of Arithromyacin but my body feels achy and my throat feels sore. Very sore. Burning- steak -knife- to -the -throat -sore. There are many types of pain but throat pain, to me, is one of the worst. It must remind me of my childhood when I suffered continuously with sore throats, strep and tonsilitis, all the time. So much that when I graduated from college I had to have my tonsils taken out. To say it was not pretty is an extreme understatement. After the tonsillectomy the pain was the worst pain I had ever experienced; THAT pain was worse than childbirth. I remember living back home at my parents apartment, in my old room, moaning from pain. My mother fed me too much codeine because it hurt her to see me in so much pain. I remember hallucinating that I was talking to angels. My father literally threatened to go to the Doctor’s house with a baseball bat. The purest form of parental love. I also have an auto-immune disease whose aches feel different from the ones I am experiencing now. I am 53 but feel older, I am 53 but think I look younger. After much work and determination, I lost 20 pounds and it is nice to see my waist line indentation. I am an hourglass, once again, green eyes dancing, brown hair in a side ponytail, wearing necklaces. I heard from several people who suggested I should eat a teaspoon of raw honey each morning to improve my auto-immune disease. I started yesterday, somewhat suspiciously, looking at the mayonnaise-like substance. I ate the teaspoon and it did indeed taste much better than the lard it looked like. I am still waiting for the energy to come. Given that I am on antibiotics maybe a little patience would do me good. Actually, patience would always do me good….. I had a big bowl of juicy blueberries for lunch, some organic honey -lemon soothing drops for my throat, a Nyquil tablet and a nap. For dinner I had comfort food: tomato soup with mashed Saltine crackers and a piece of cheese that melted slowly into long strands of stringy goodness. For dessert I had a brand new favorite, the tropical ice-pops from Trader Joe’s, that had little pieces of frozen fruit inside them, they were amazingly pretty to look at, tasted heavenly and numbed my throat momentarily. I only slept seven hours because I was in so much pain that I kept waking up. I am about to eat another teaspoon of honey, watch Fiddler On The Roof and see the sunshine bounce off my bedroom window, while I am inside. Only the cool breeze from the open window reminds me that it really is lovely outside, just about Spring, and that I am missing an amazing day. There’s always tomorrow.